Los Angeles, California may be best known for it’s 80’s glam scene, but there has always been a decent buzz surrounding other genres of metal. Blade Killer represent the straight-ahead traditional brigade – together since 2012 and releasing a self-titled EP in 2014 before being picked up recently by M-Theory Audio. High Risk is the first full-length from the quintet, and a rather quick affair at eight songs not quite clipping the half-hour mark. Quality reigns supreme even at this stage of the band’s career, and the solid mechanics and resolute affinity to catchy hooks and potent melodies is quite impressive. It’s hard not to be giddy at the twin spider web guitar action and complimentary bass activities for “Lost Angels” and “Rush” where Jonathan Rubio, Jay Vazquez and Kelsey Wilson form this triad of harmony to the hilt, driving home riffs and sequences like Omen, Iron Maiden, and other early NWOBHM offshoots. Vocalist Carlos Gutierrez can certainly hit those piercing, eagle-high bird call notes if need be for “Endangered”, but he’s just as at home during the semi-galloping “In the Arms” where he’s able to show a bit of his older Paul Di’Anno-like charm. The band stack addictive riff on top of another stunning part – assuring massive neck whipping action from start to finish – even as the bass/guitar/drums often stop and start to set up the next speedy passage or go into more of a comfortable groove, which you’ll get through the exciting title track. 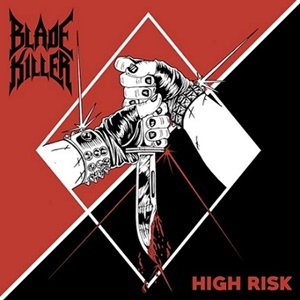 Blade Killer aren’t going to be the most complex act as far as phrasing and time signature switch-ups – they just go for the gusto as far as addictive parts and add the spice and flash to heighten levels of dynamic contrast song for song. The production contains throwback qualities such as delay/reverb at specific trailing vocal parts and a natural snare/tom to kick tone that is refreshing in an era where triggers rule the digital studio landscape. Top it off with a simple and effective cover, and you know quickly why Blade Killer are rising up as a force in the traditional heavy metal scene based on this record. Another young band that proves the roots of heavy metal are not going to fade away anytime within the next generation or two if this five-piece has the tools to keep writing, recording, and touring.